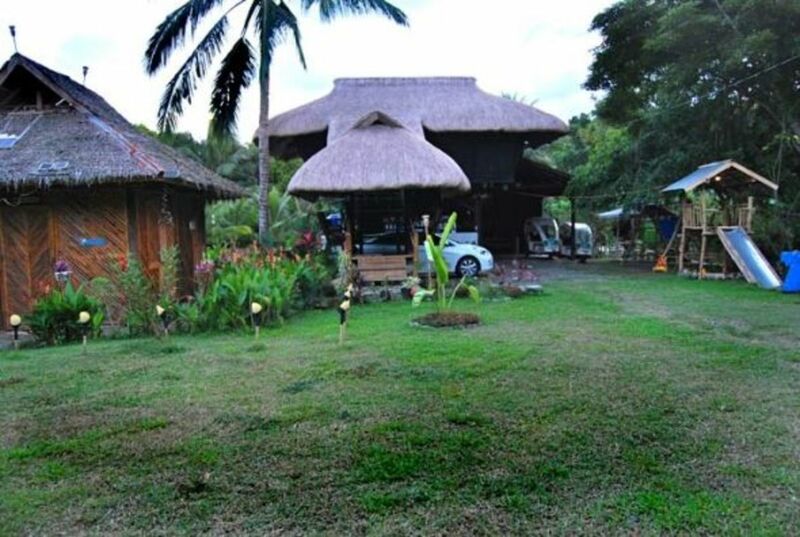 This is the 2nd building we put in made of bamboo and native woods and cogon grass as thatch for the roof. 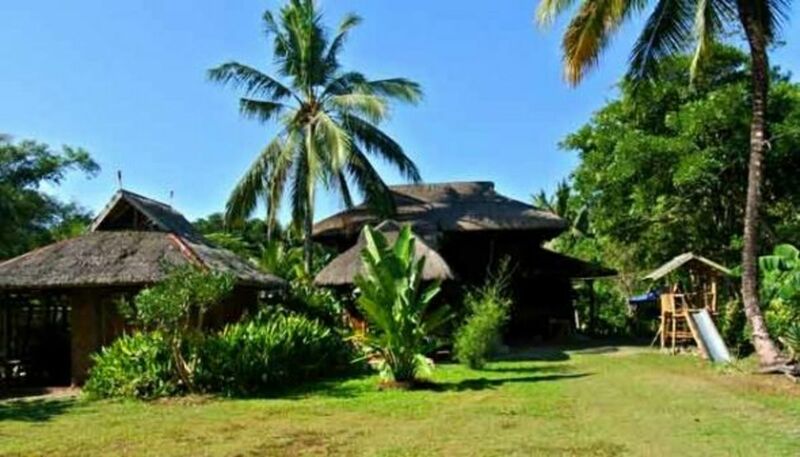 We bought a 2 hectare (approximately 5.5 acres) farm in Luzviminda, Puerto Princesa, Palawan, Philippines. When I first posted this blog, only the pumphouse was being built, we have since built a large barn and now live in an apartment above it. 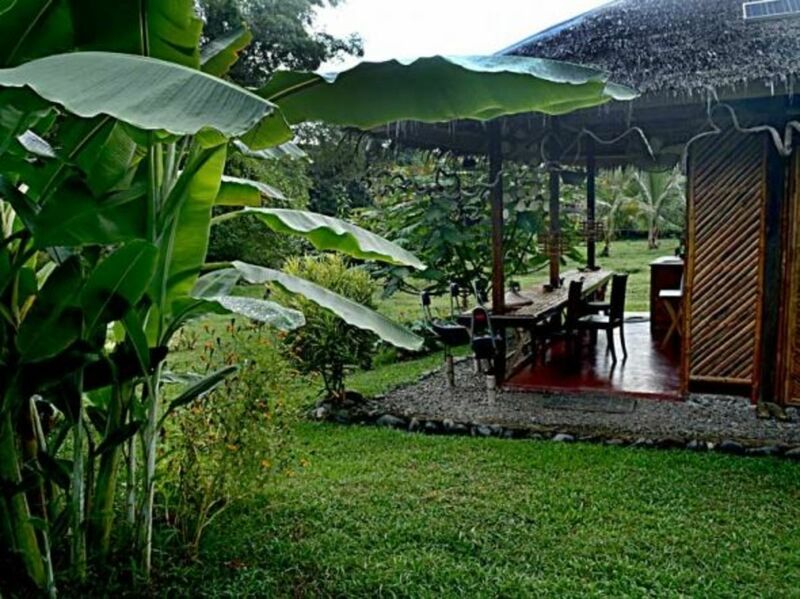 Our dream is to be as off the grid and as self sustaining as we possibly can. 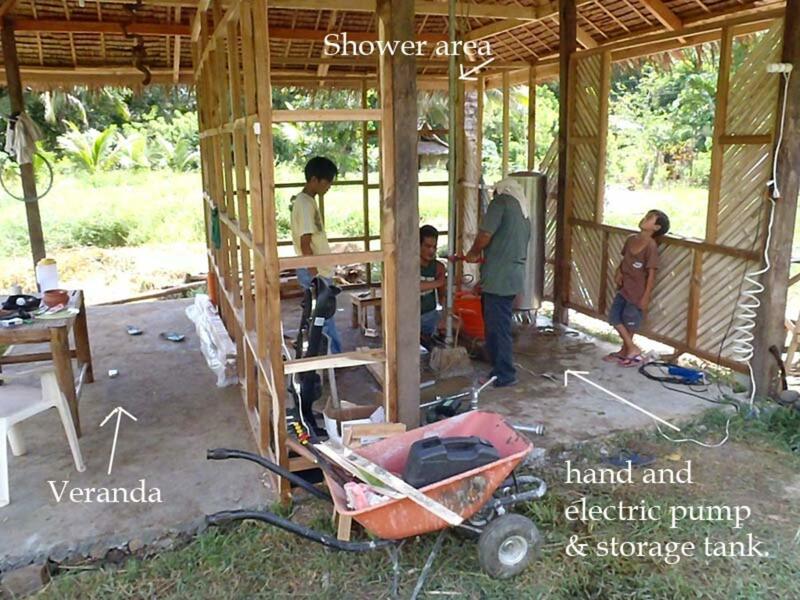 Dave is using green technology such as solar lighting along with using as many native materials as possible. We have 5 bamboo groves on the property and have been able to selectively harvest enough to use as the siding on the native pump house. 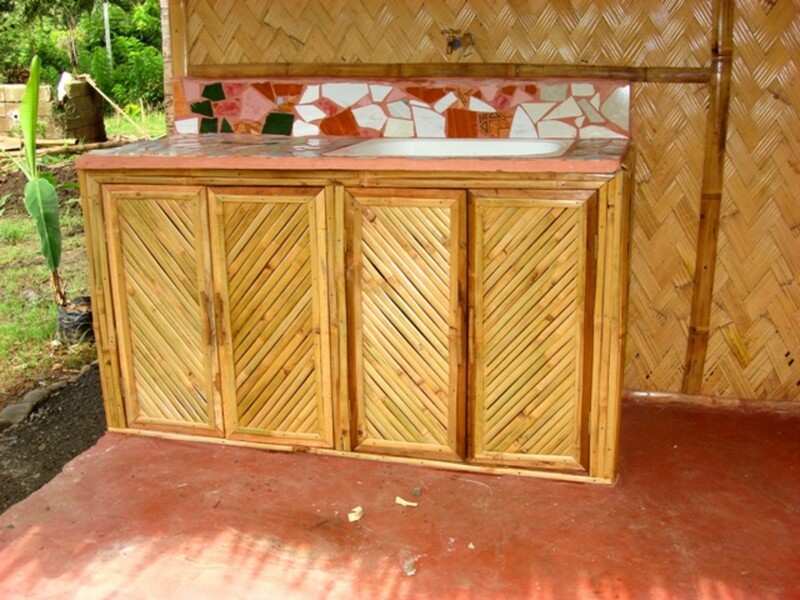 We are using recycled materials such as broken tiles and bamboo scraps for towel rods and cupboard handles, which the carpenters used to burn! Eventually I want to try my hand at aeropoincs gardening. This should save on water and soil. We have begun harvest rain, recycle grey water, use worms (as in vermiculture) to process household wastes and grow all our own food via organic farming practices using compost made by worms. Oh! 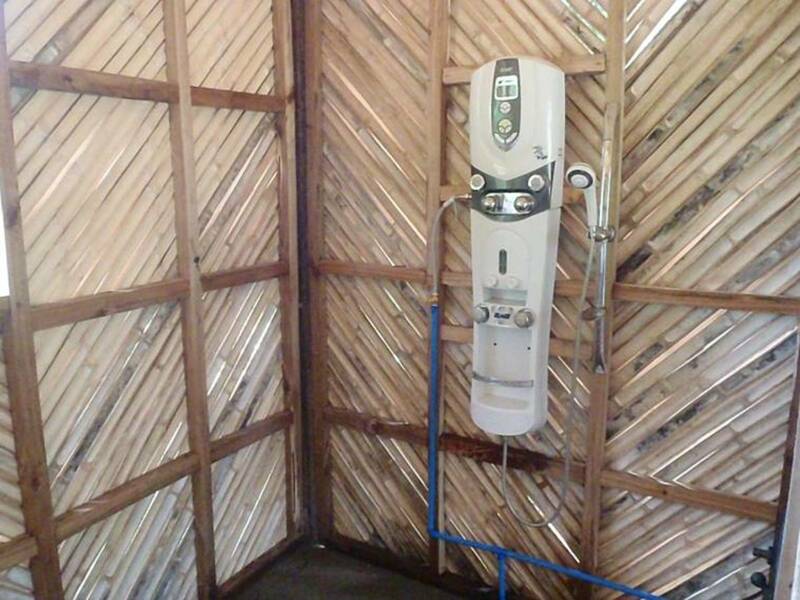 And we also drive electric motorcycles, e-trikes and use an electric farm vehicle the we call the electric carabao (water buffalo). This blog is how we started with the pump house cottage which was also used as the first shower house and eating area while we planned our next move. Because we live so far out of town, it's difficult sometimes to get supplies delivered here, so the next building was a large barn to store the materials out of the rain. 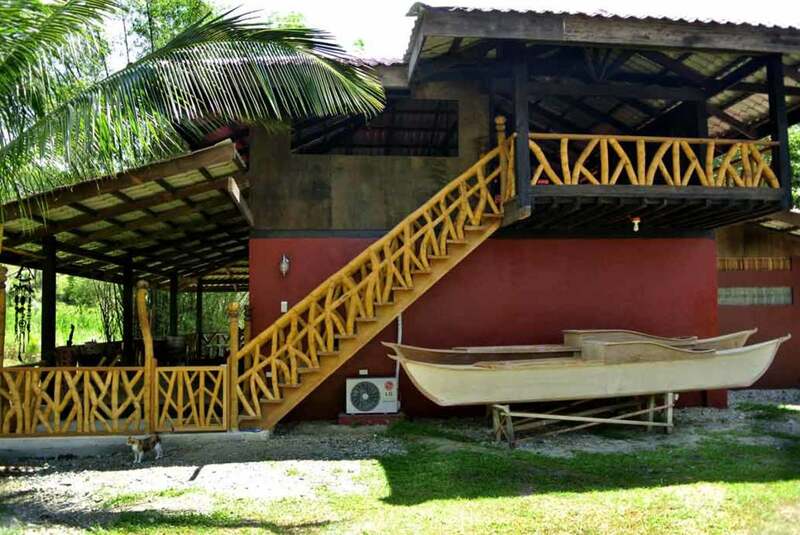 It was so big that we decided too put an apartment upstairs so that when we build the ain house, we will be on premise to monitor the workers. Sometimes things aren't always put where you told then to, like wallks and plumbing!! 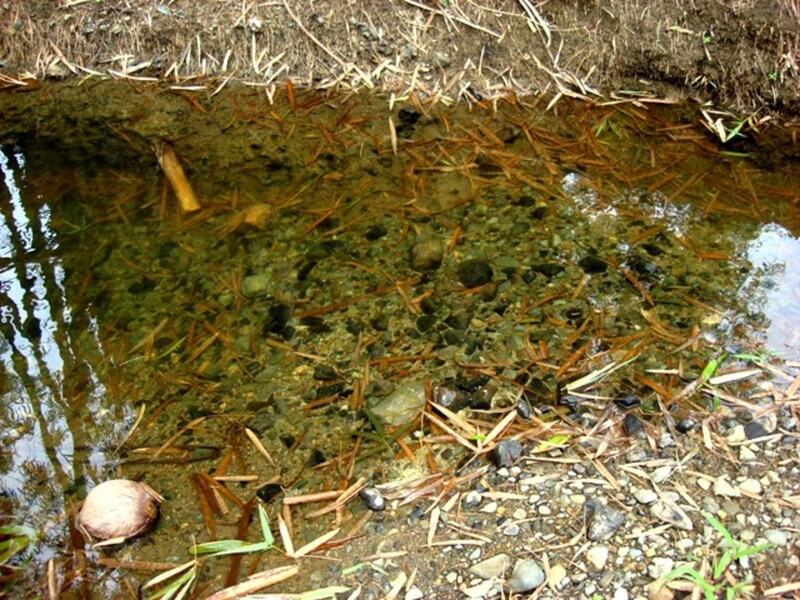 July 21, 2010 - Before we did anything, we realized we needed running water; our own water source. Our caretaker was walking 1/2 kilometers to a well and carrying buckets back to wash dishes with and to bathe in! This is drilling for water the hard way. One of the problems of building out so far from the city is skilled labor and hi tech equipment. One chap from the barangay came by and offered his services, so we went with him. 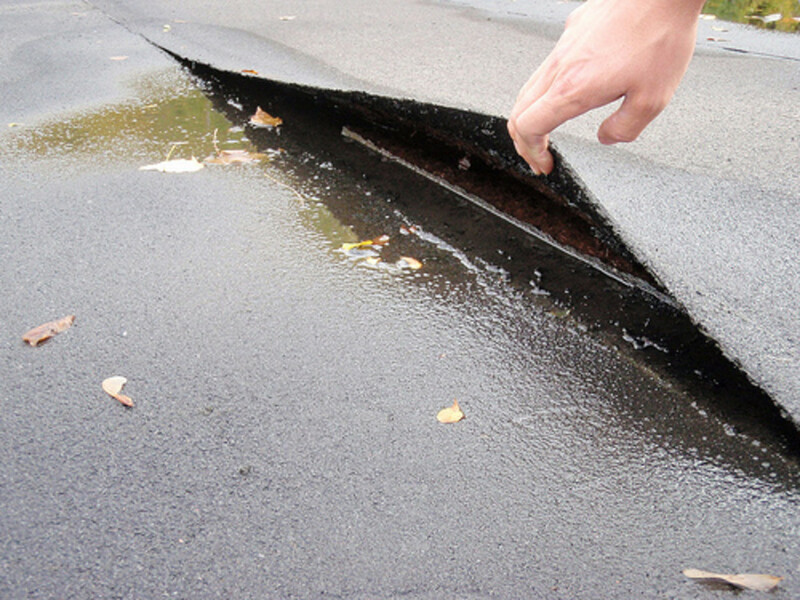 He and I both witched for water using his metal roads and this is one of the two spots we found. There were so many rocks in the way it took them a week to find water, but at 50 feet we finally struck gold as it were. Our first step in self sufficiency! Not to mention, ever so much easier on our caretaker than walking half a Km to the community water well and lugging plastic jugs back! 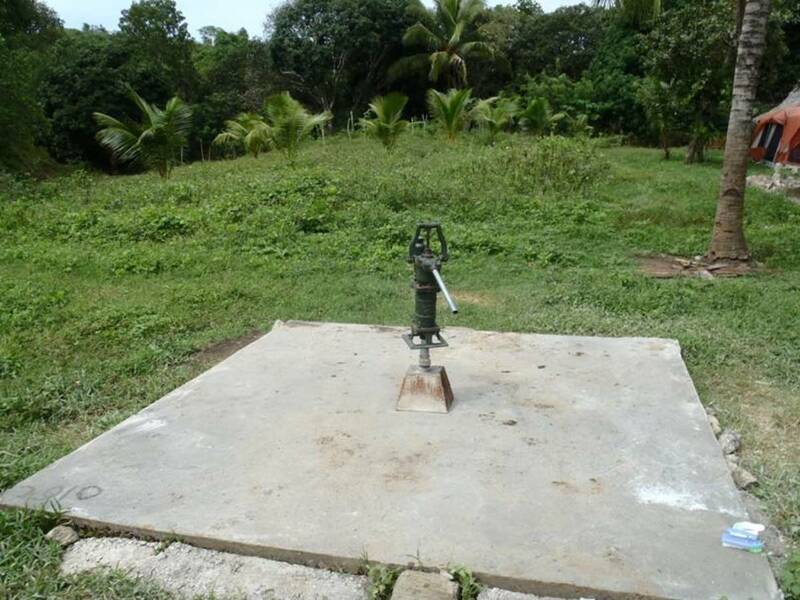 Hand pump installed on the well and a 16x16 cement slab. Aug. 6, 2010 - This is the first step we took. 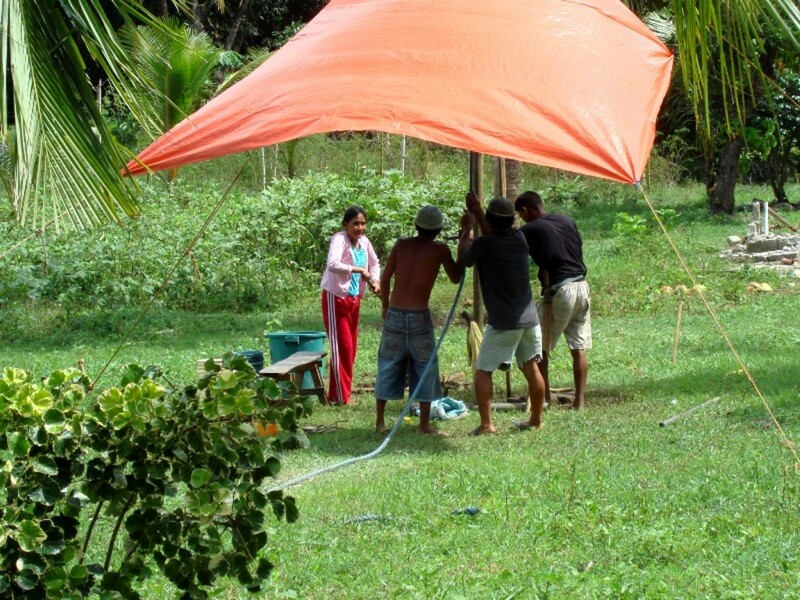 After inspection, we decided that we would extend the cement slab to 16X16 meters and build a native shack around it. There is nothing but the caretakers' cottage on the farm. Nowhere for us to sit in the shade except right next to their hut. 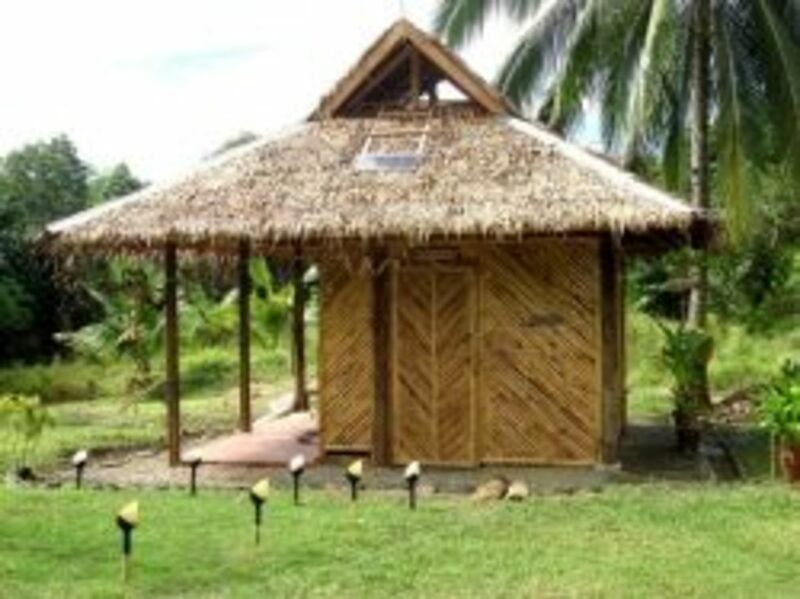 We decided to expand the slab so the hut would not only house the water well equipment, but could also offer a private shower area for us and small veranda to sit in out of the sun and away from the caretakers cottage so we could have a little privacy. 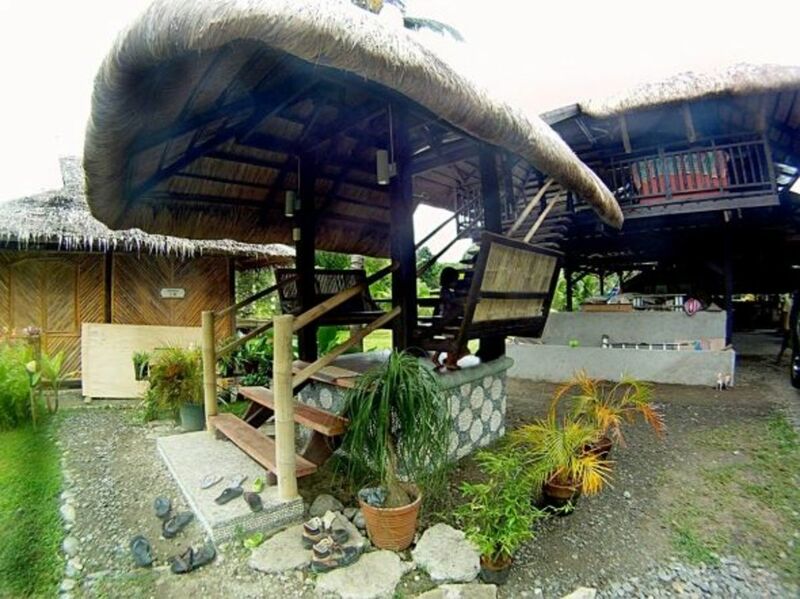 Cogon thatched staircase and roof on upper native deck. Our electric tricycles are parked under the stairs. This blog has gotten out of sequence but how we started with the pumphouse is still here to show the progression. The original pumphouse featured here, far left thatched roof is now 2 years old. 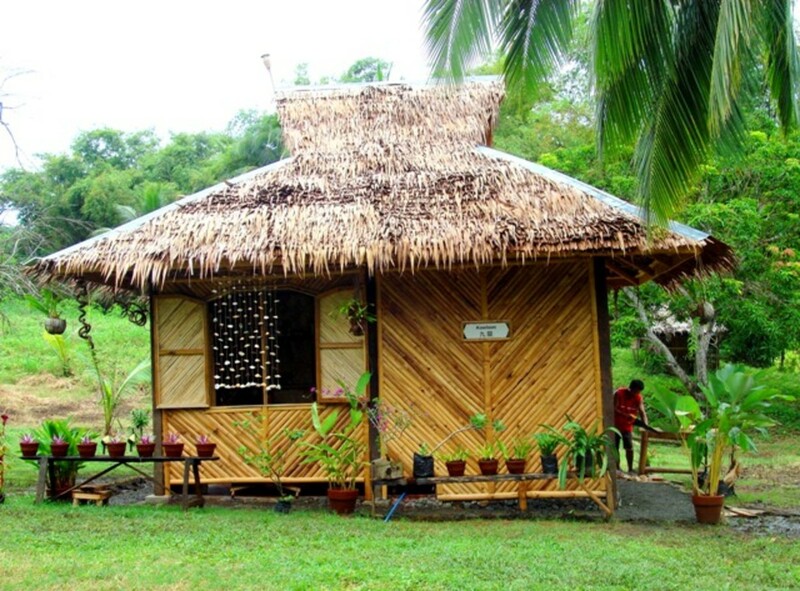 Our new bedroom cottage- 2014 - Using bamboo from our groves. I had the carpenters use all the crooked bamboo for the railings. They aren't used to this. They usually burn or discard the crooked stuff. Mobile made from various scrap and native materials. 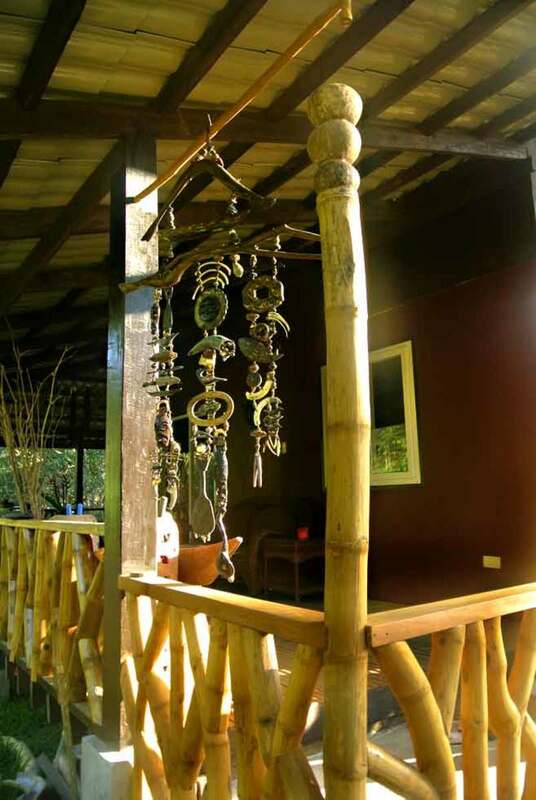 Bamboo railing and posts capped with coconut shells discarded from making coconut milk. 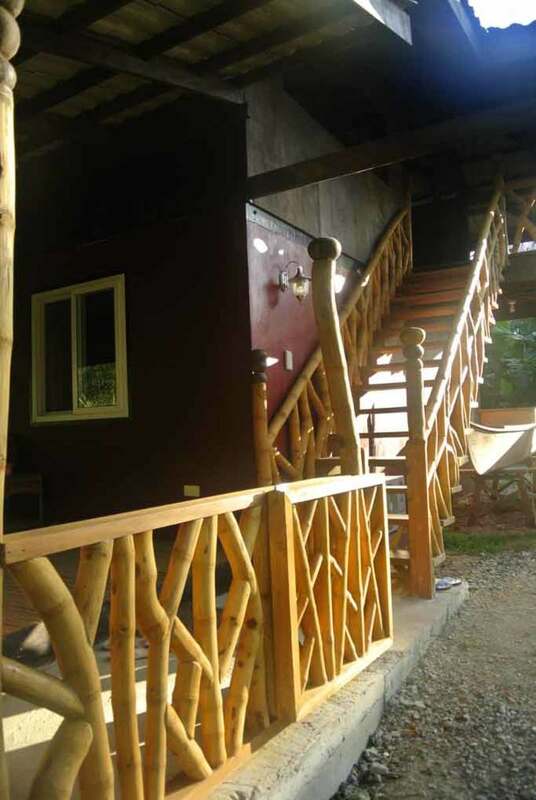 View of sugar cane from our new deck.Railing and bamboo floors all made from bamboo from our groves. 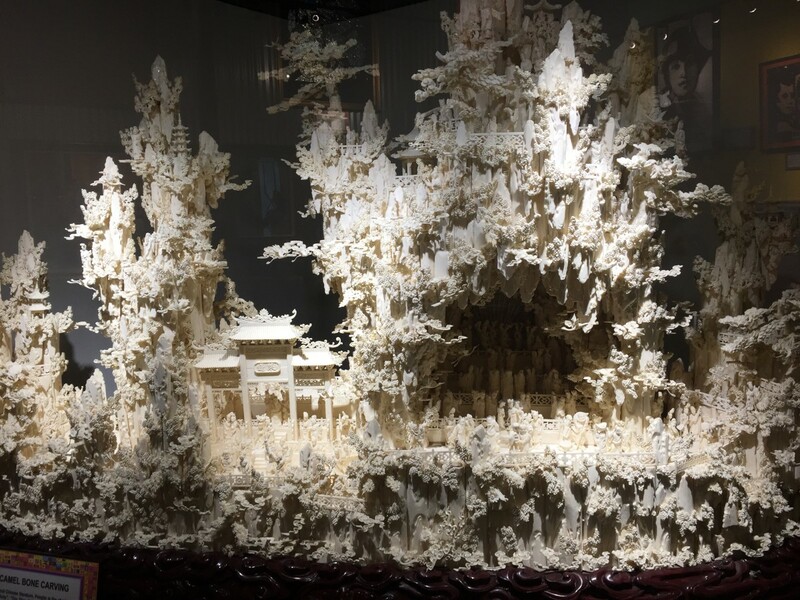 You can see one grove in the middle. 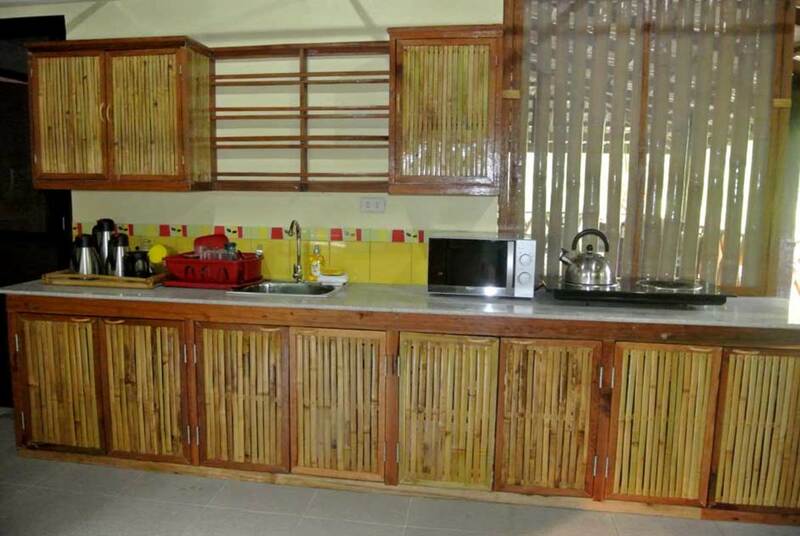 New kitchen cabinets all from scrap bamboo from flooring. All from our groves. 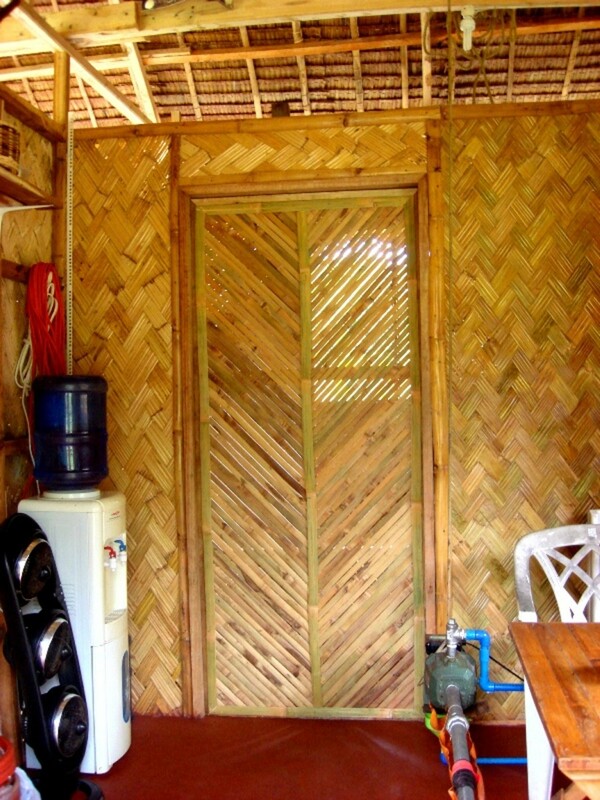 The wall in back of the tea kettle is from solid bamboo poles which is screened to keep the tropical bugs out! This deck leads to our apartment built above our converted barn. Dave had an all bamboo playset made for our 4 year old daughter Alysha. It's a swing, slide, sandbox and little covered upper deck. All the bamboo was from our groves. The native hut on the left is the one that I have featured being built on this page. It's now two years old! The plants grow so fast around here. We have added more solar panels on the main roof (not shown) which runs all of the lighting. After three years, we had to change the native nipa thatch on the pump house. We have now covered it in netting to keep the chickens from scratching at it. Compared to January 2012 the plants in front are so much bigger. June - 2013 - Breezeway between pump house - and house was once a muddy area. This is the view from my front steps. Far left is one of the benches on the landing to steps going to our personal apartment and my native office deck. This was a muddy walk to the pump house and animal shelter. 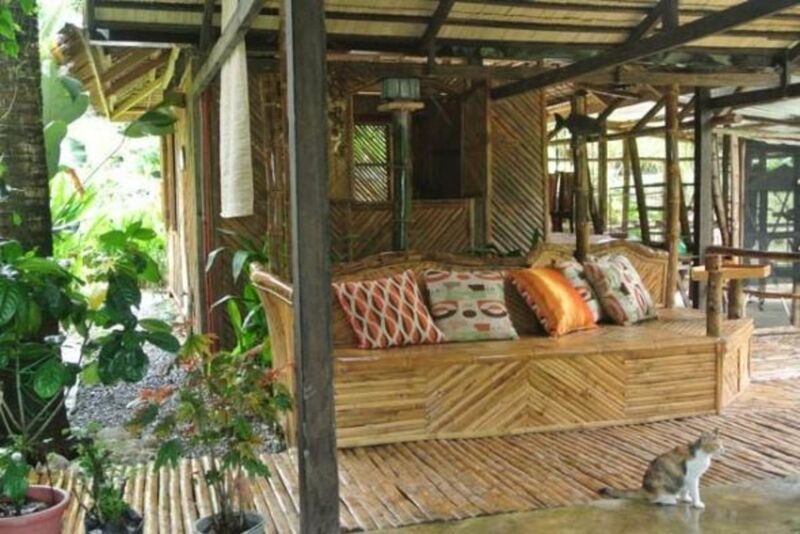 We put in the bamboo couch bench as well as a bamboo roof to protect it. We now have a nice outdoors sitting area. 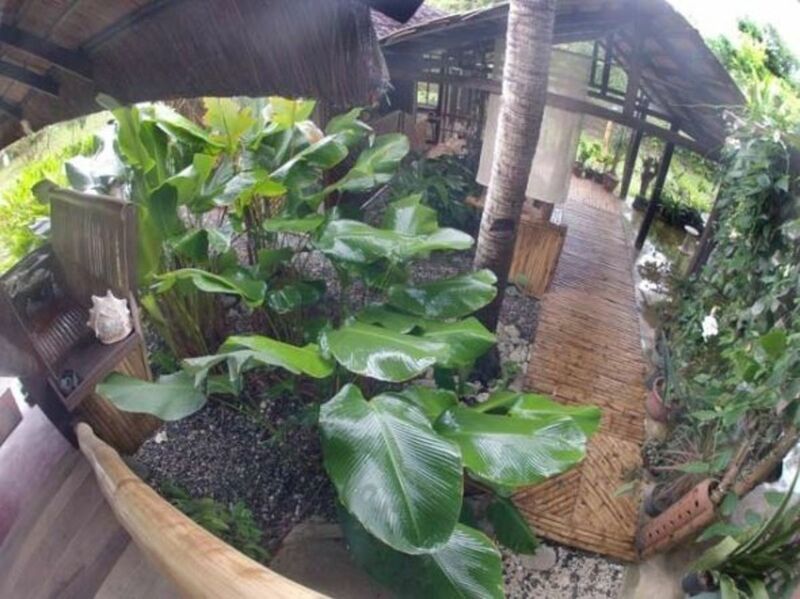 We put in a bamboo raised pathway to get off the mud, and the rains can still drain under it. No more much going to feed the animals. This is where I work from. This is what the deck looks like inside. It's at tree level so when I look out from my deck, all I see is green. For the sake of expediency, as we were in a hurry to move in, we just wrapped green house netting all around it to keep the bugs out! 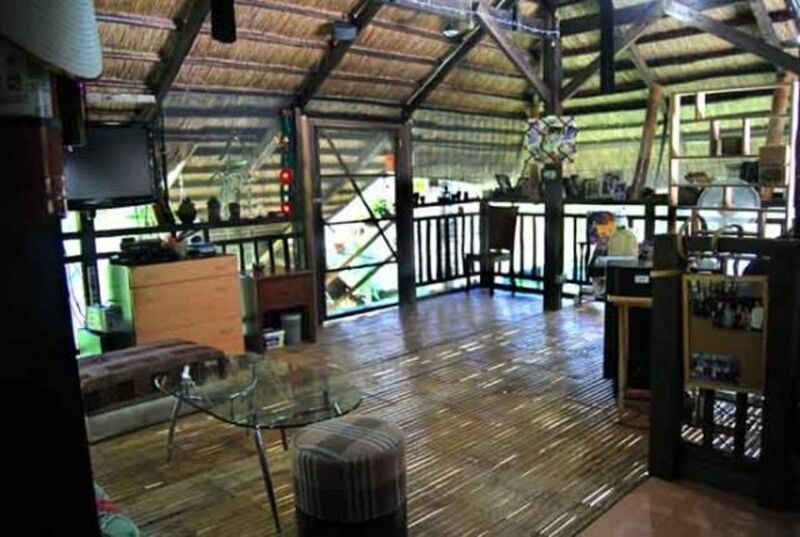 I had them make the traditional slatted bamboo floors so it would stay cool and also, it comforts me with a flood of lovely childhood memories. Homemade Virgin coconut oil, cold pressed. 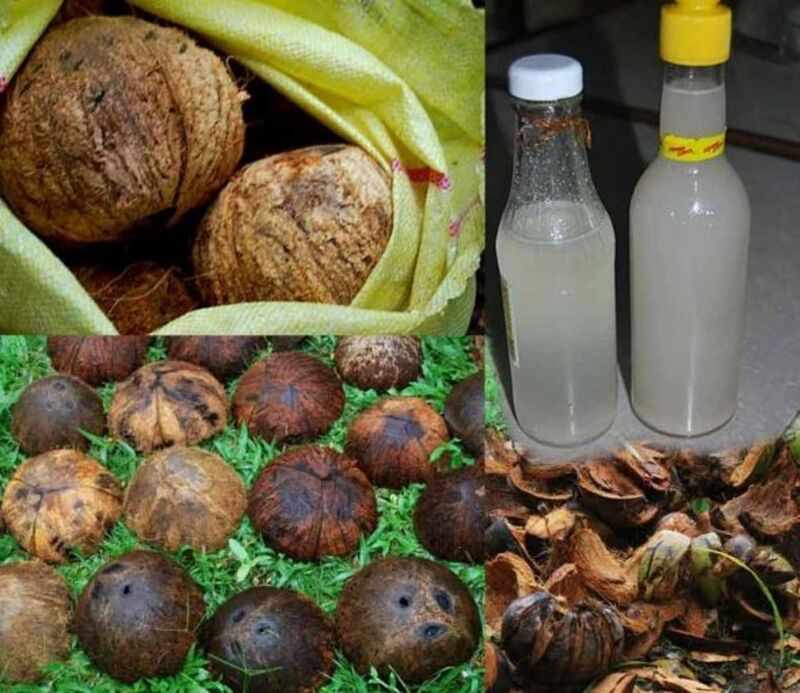 We have so many coconuts on the property, we drink a lot of coconut water from the green coconuts, and coconut milk in curries, I decided we might as well try to make our own Virgin Coconut Oil or VCO. It took 10 coconuts to make the 2 bottles in the photo. I now know why it's so expensive! 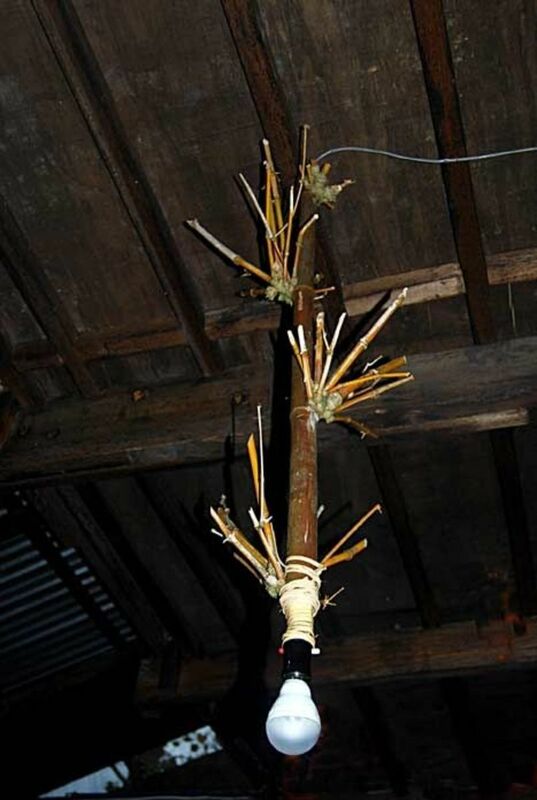 However, with the waste products we make orchid holders from the husks, bowls and lamp shades from the hard shells, the water that separates from the milk can be fermented into vinegar and the grated and pressed coconut meat is used as a soil conditioner and feed for our chickens who love it. 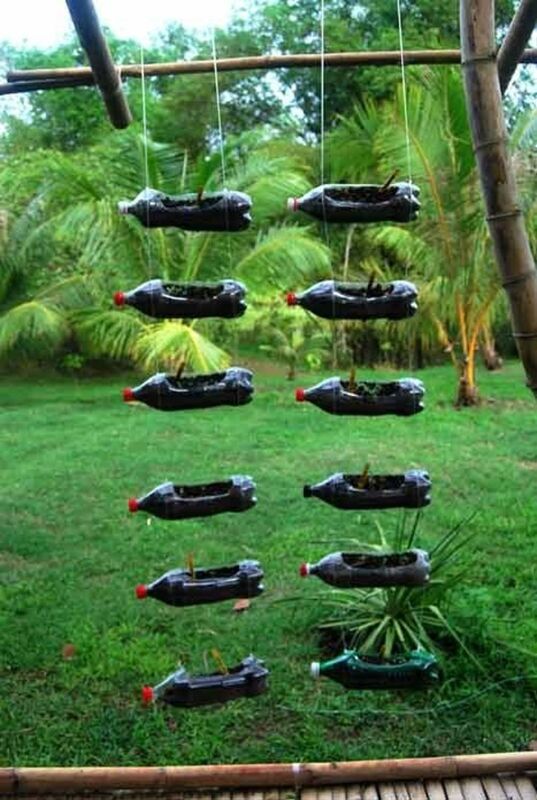 Recycled plastic soda bottles as hanging planters - The seeds have only just sprouted. We live on an island, as such, it has limited capacity for trash. With the hundreds of thousands of tourists arriving to see the Underground River, the sale of water in plastic bottles has escalated. We are trying to recycle as much as we can. The use of plastic bottles as hanging planters was an idea I got off Facebook and felt it was a good use of the bottles. Plus the local school has become interested in teaching the children to do this and has become a school project as well. 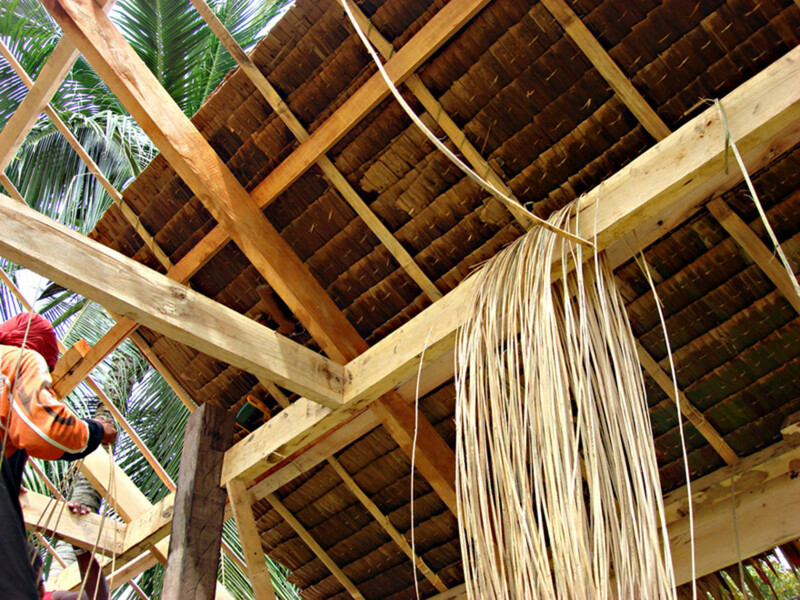 Nipa roofing being used by our carpenters with rattan twine. Bamboo poles for siding from our own grove. Are from our own bamboo groves. They are making them into strips for the siding for the pump house. 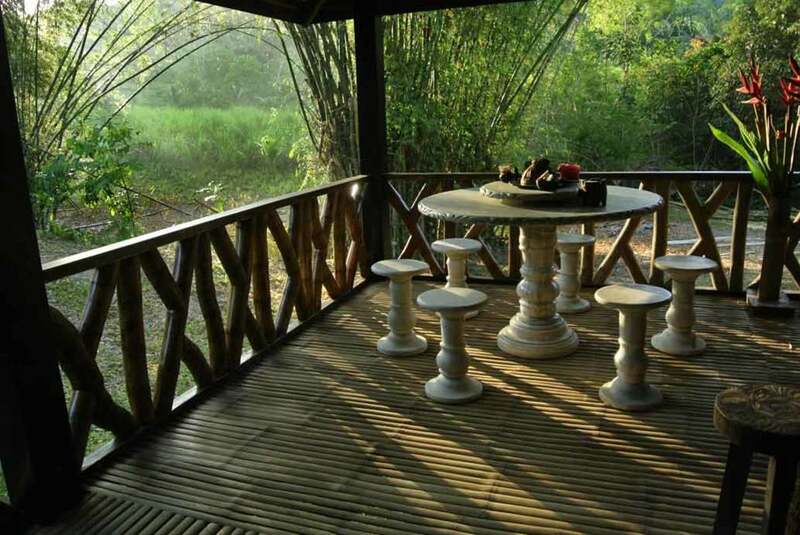 One problem with bamboo if it isn't treated for termites, it that is eaten fast! One way to preserve the bamboo is to soak it in sea water for a month. We might have to build a trough to soak them in salt water since we don't have beachfront property where we could keep an eye out on the bamboo while they soak. Our own Bambusa bamboo grove - Selectively harvesting our giant thorny bamboo. Our own bamboo grove where we harvested the wood for our pump house. Aka arundinacea giant thorny bamboo. It turns out our bamboo grove is called thorny bamboo. 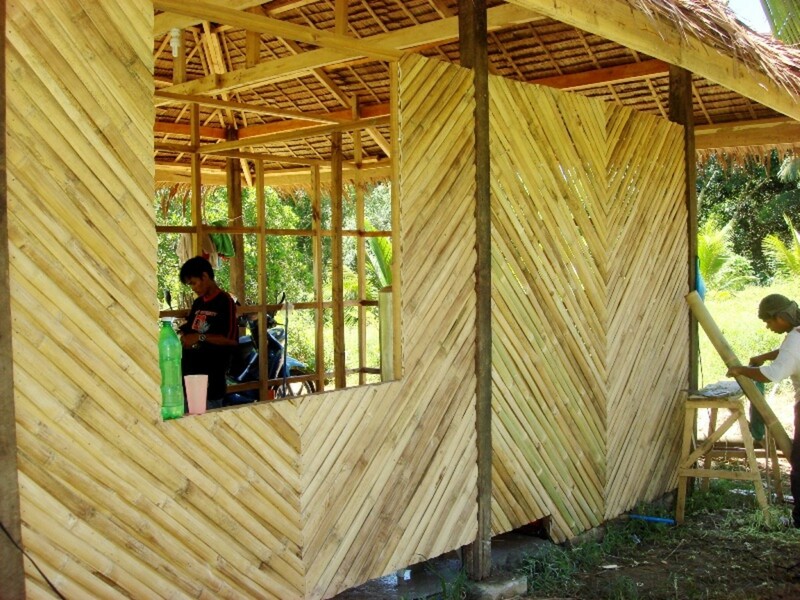 Some of the best bamboo around for building.Talk about sustainable. The shoots are edible, the walls are thick and planted as a fence are impenetrable because of the thorny stalks. The leaves are emetic for worms and the thorny stems are used to make paper! 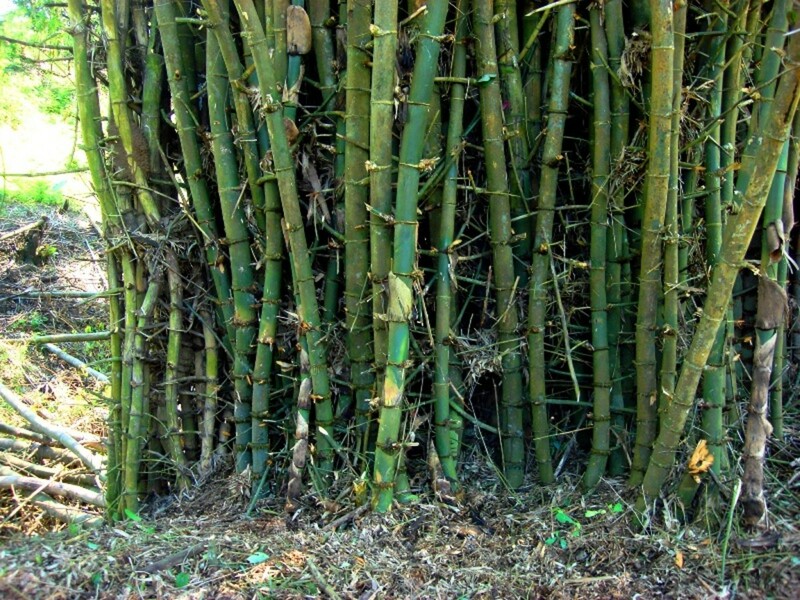 The bamboo stalks can grow to 150 feet tall. 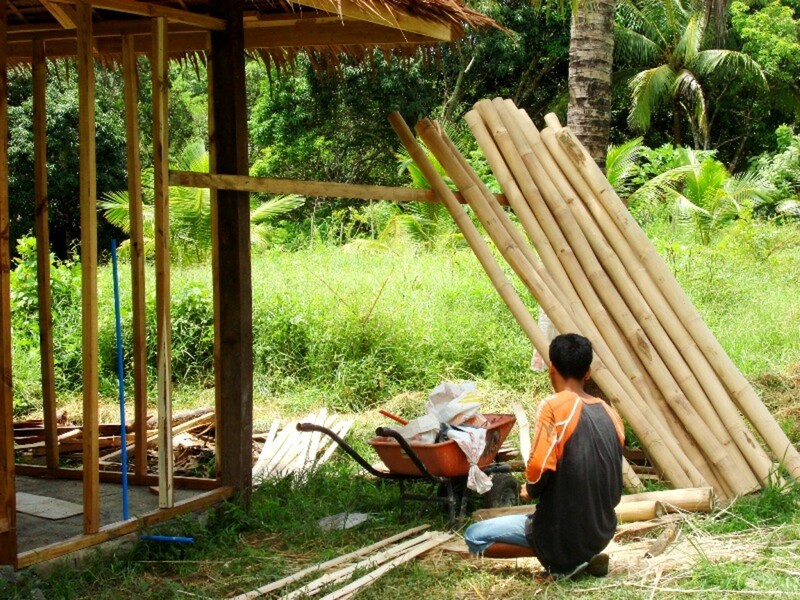 If we are careful, our 5 groves will continue to give us wood to build our huts with. During the rainy season, I have literally watched the new sprouts grow over a foot a day! 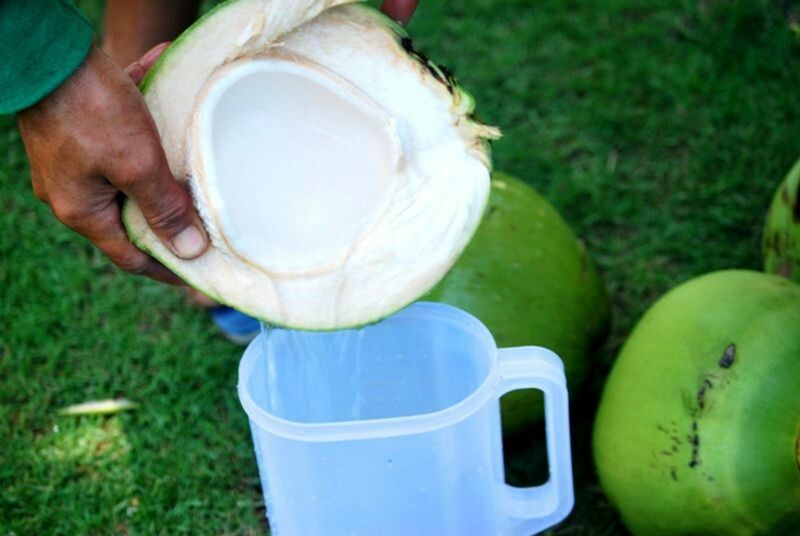 Fresh buko juice off the farm. Very healthy drink, replenishes electrolytes in body! 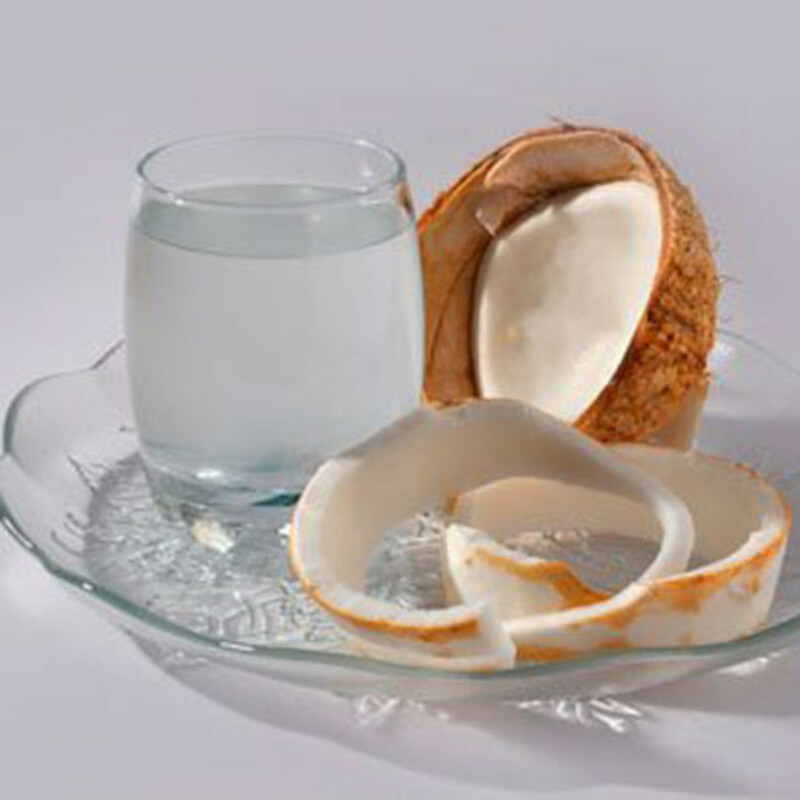 Coconut water, or locally known as Buko juice, is the purest liquid second only to water itself. 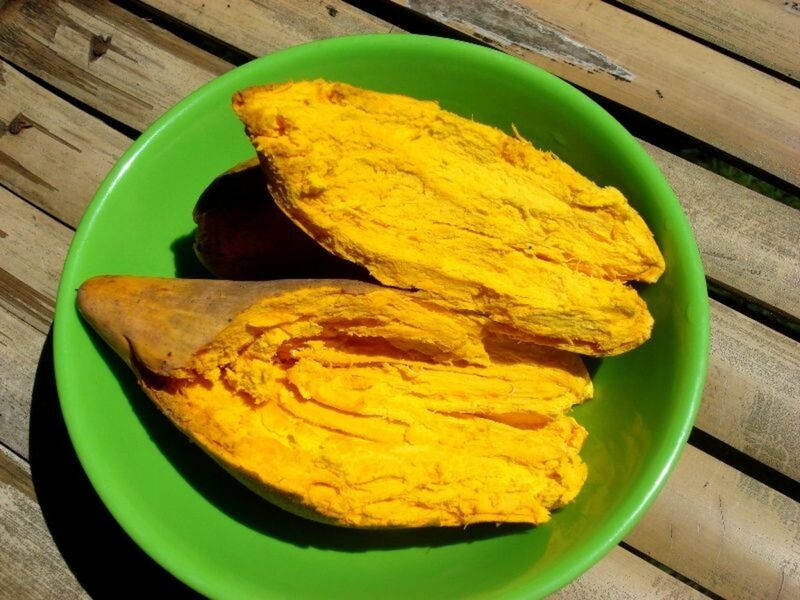 It is chock full of electrolytes, calcium, potassium, magnesium; everything that is good for you. Native pump house with solar panels for lighting as well as solar tiki torches. 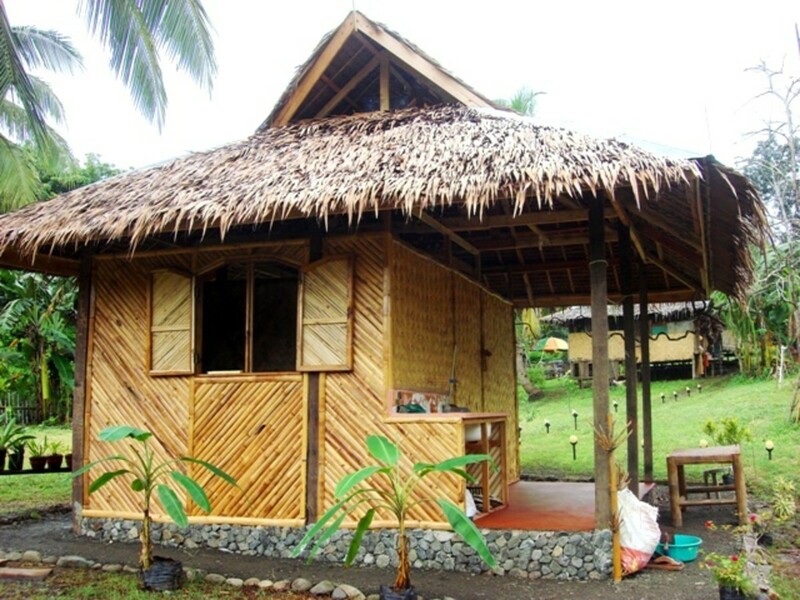 Sept. 15, 2010 - The wood is all local and the bamboo for the siding is from our own groves. 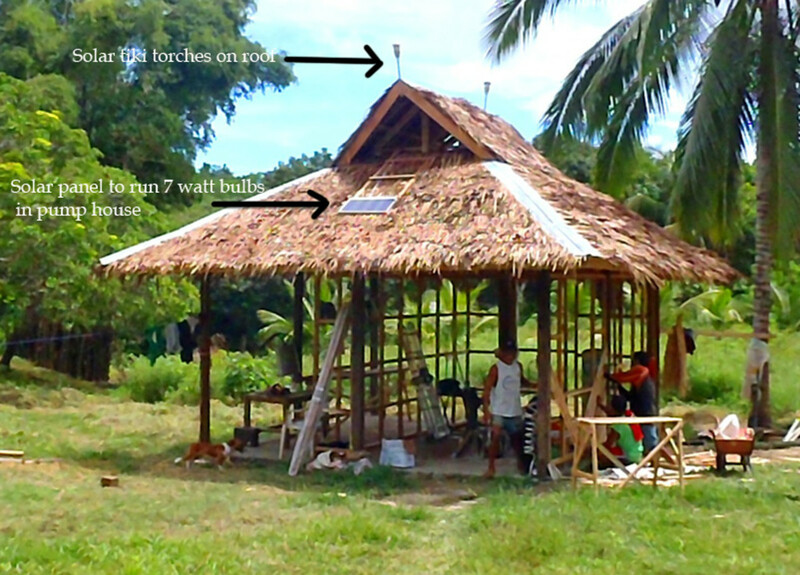 Dave put up the solar panels so there would be lighting inside the hut at night. There are two 12 volt, energy efficient bulbs, they run all night and run off batteries Dave recycled. He found out that car and motorcycle batterries put out quite enough energy from the solar panels do to that job! So don't be throwing away those car batteries folks Use them to light your own areas with solar. That's a big savings in upfront cost right there! Bamboo wall- one down three to go. Two more to go...Made with the bamboo from our own groves. I can start to see the little veranda area we blocked off. After we put in the well and had water with a hand pump, we wanted to attach an electrical motor and water tank, but with the ability to switch back to hand pump in a brown out. Then since we had to put up a building over the motor, we decided to expand it to accommodate an enclosed shower area the well is exposed to the street. 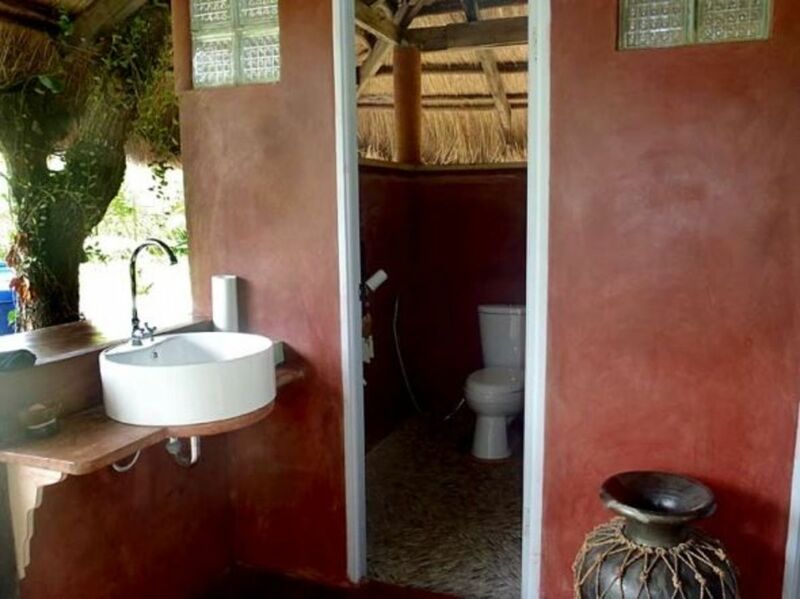 This way we could clean up at the end of the day, in privacy and a dry place to change clothes in. 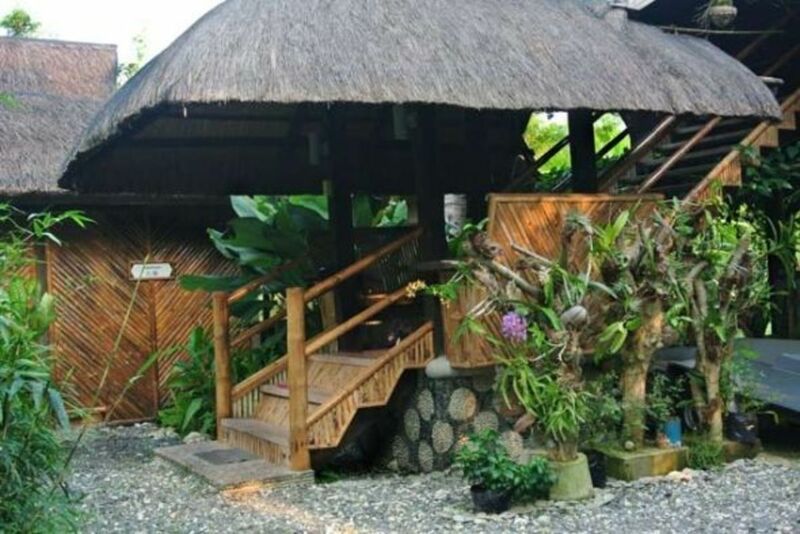 We also didn't have a place away from the caretakers cottage so we expanded the building to the back so we could have a veranda to relax at in the shade. The shower stall just needs the bamboo sprayed with anti termite stuff and then lacquered so the water doesn't water it so fast. Outdoor sink on patio - This will be handy. 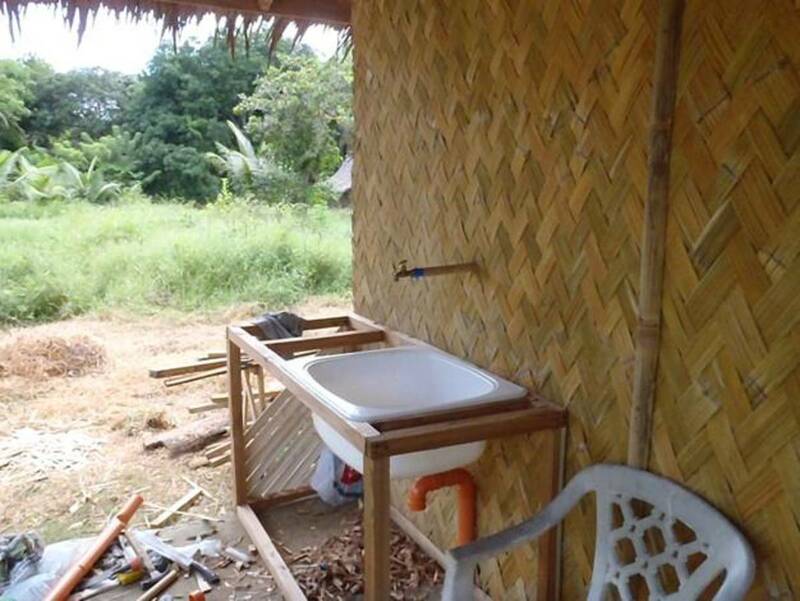 I put the sink outside the shower room so someone could brush their teeth or wash hands while someone else was taking a shower. The whole pump house is lit by solar lighting. June - 2012 -We found these new solar LED light bulbs in town. They are rated at 5 watts. When we installed them and turned them on one night, they turned out to be brighter than our energy saving electric bulbs! We have now installed about 6 of them all over the property. They use so little of our battery storage that I can run one over my desk all day now instead of the electric powered bulb! Yay! Pump house almost done - solar lights lining the path. Pump house is now 3/4 complete! Yahoo...interior windows, wall and doors next! Front of pumphouse - that faces the street. Just a few last touches and it's ready for us to hang out in soon! Pump house hut showing patio. - A done deal. Pump house hut showing patio and shower window. Oct. 9- 2010 -Finally done! Mostly! The cement floor was just stained with red cement dye. We recycled some broken tiles and used them on the sink and the shower room. 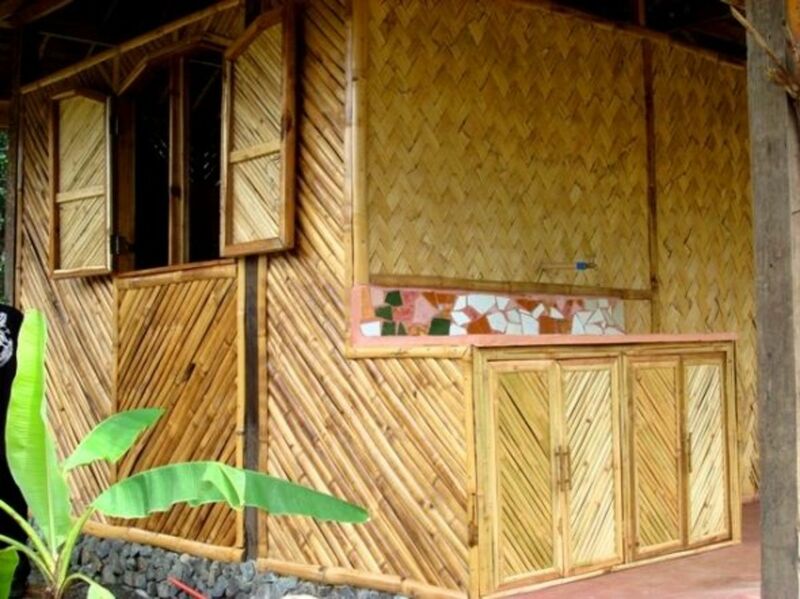 The bamboo siding was hand cut from our grove by the local carpenters and placed using my design. Window leads to the shower area. In the background are solar path lights leading to the caretaker's cottage. This is pretty much done now. Only thing lacking are the cabinet doors for under the sink. There is now a covered couch bench on the side of the pump house and a bamboo walkway. How different it looks now only three years later! Recycling chip bags - and turning them into art. Hanging door decoration made from recycled tetra packs. Hanging door decoration made from recycled tetra packs. Made by our bamboo worker's wife from the bags of chip snacks they eat and seeds they find on their property. I am going to have her teach others in the village, buy them from her and sell them. Already have orders for them! 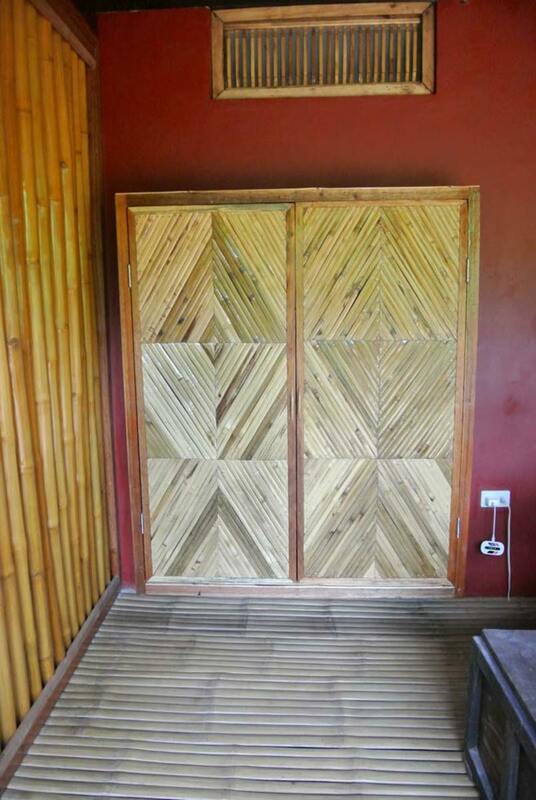 Bamboo shower door from our own grove. Inside door to shower. I wanted the materials to come from our own land, so this took longer than just buying a ready made door. Turned out nicely eh? 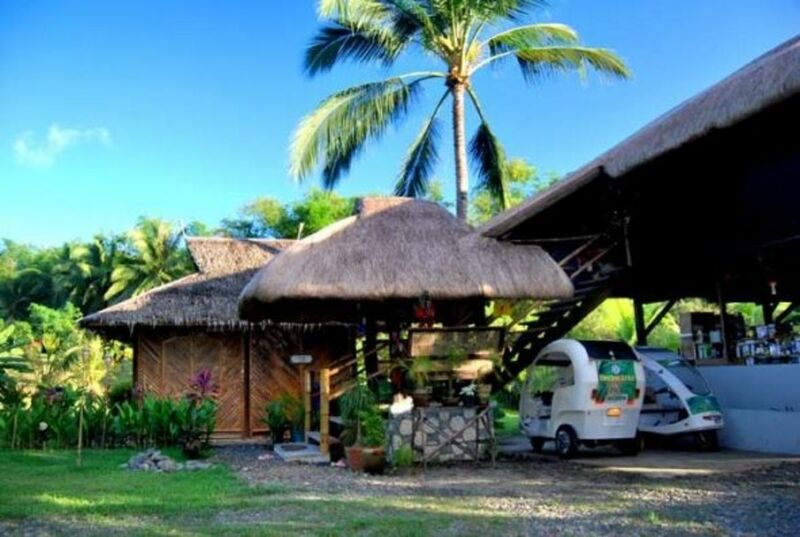 The siding is pre made and sold most everyhwhere, but also from locally grown materials, and then made in Puerto Princesa, Palawan. The floor is just cement with red cement dye. 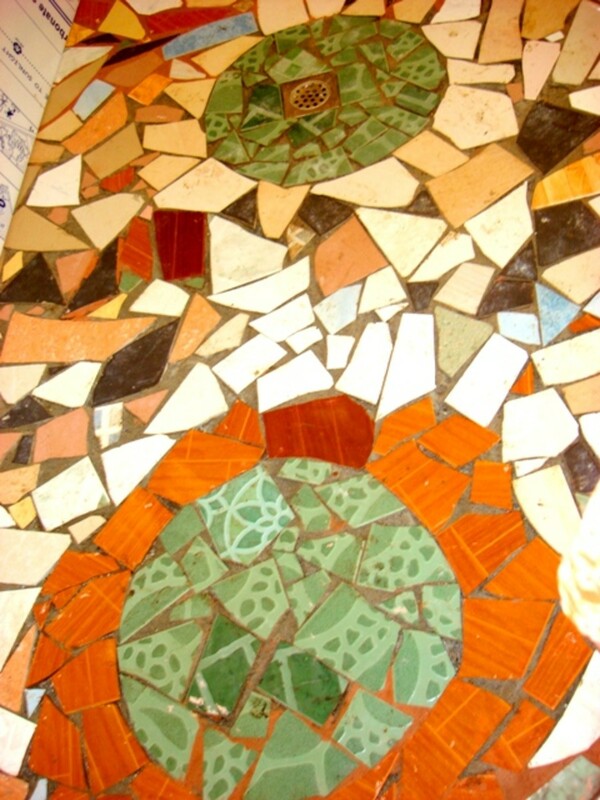 Recycled broken tiles - for the shower room. We used recycled broken tiles for the shower stall. I gave the workers my ideas and they executed it. There is no grout yet though. Tile cost was about 6.52 USD for all the tiles for the shower and sink area with leftovers for something else too. Bought from the local hardware store. Bamboo cupboard done - and recycled broken tile sink too! Bamboo cupboards and recycled tile sink done. This is the one area I couldn't wait for to be done. We finally have a little spot in the shade to contemplate our next move and someplace to wash our face and hands at the end of the day. We have little portable butane cookers to set on the counter so now we can make hot coffee or tea or even make a meal. Inside the hut is the shower area so we can clean off after getting dirty all day and not have to wait to go home to clean up. 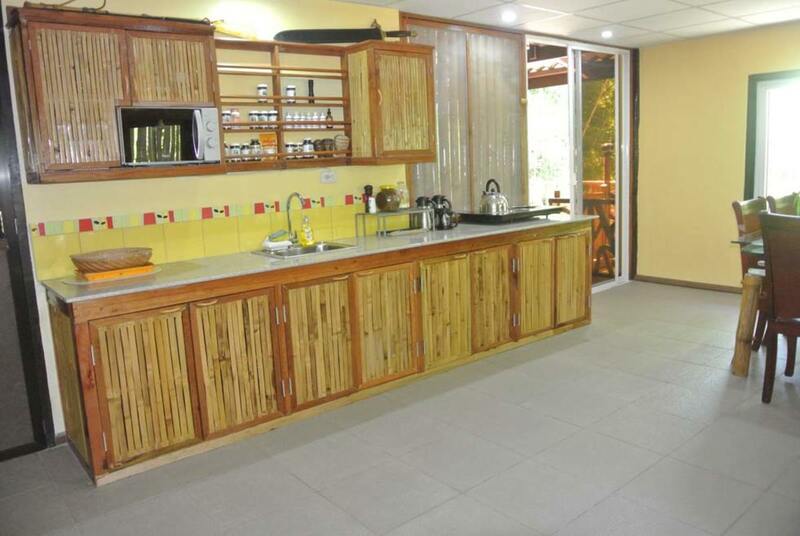 Since we couldn't just go out and buy cabinet doors that looked like these, they had to make all the pieces from scratch out of bamboo poles from our grove! Same with the siding on three of the sides facing the street. The back wall where the sink is, faces the back of the property, so we just had pre-made siding put up there to expedite things a bit! The local carpenters made the cupboard handles from bamboo scraps after I showed them how to. The floor was left cement with terracotta colored dye added to it. This is just a closer up view of the recycled tile sink and cupboards. The door to the hut done! sink in on the other side of patio. Can't wait to hang out on the little patio area and plan the next building. 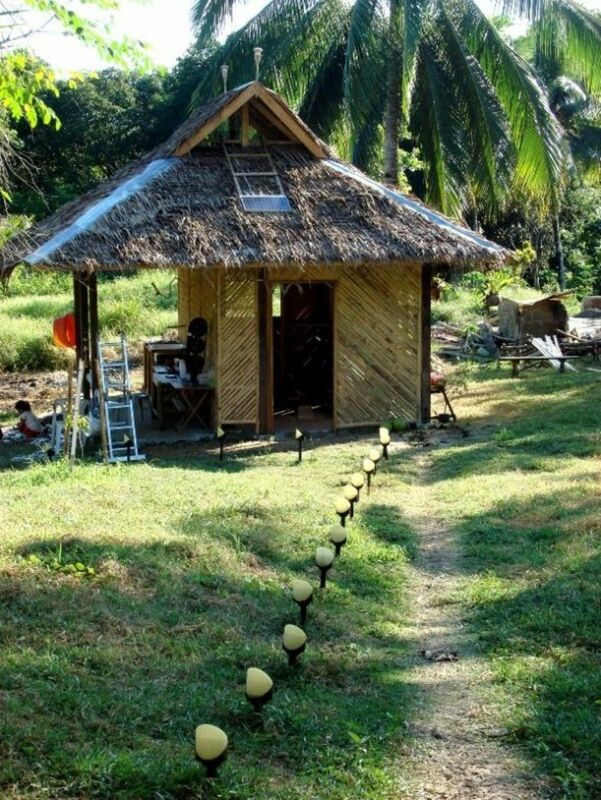 Solar lights line the path to the caretakers hut. The pump house has changed so much. It now has bamboo tables and the plants! I can't even believe how much they have grown in 6 monhs! 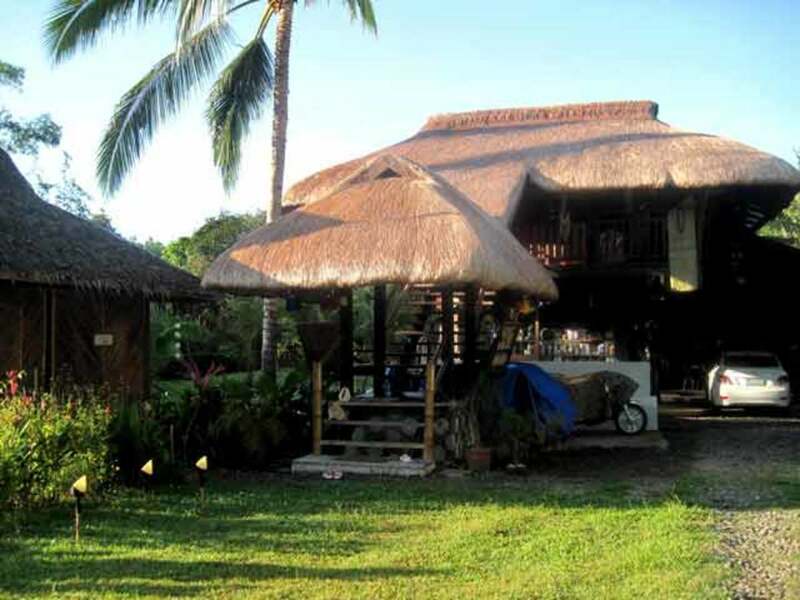 We have since built a barm, which was so tall and wide, we dedicded to build a loft apartment above it and added a native deck made of cogon thatch. We built a barn to house the supplies, which aren't always easy to come by, to protect them from the rain. We overbuilt it so much that we have also added a loft apartment above the workshop. Dowstairs there is now an enclosed kithen, shower and commode. 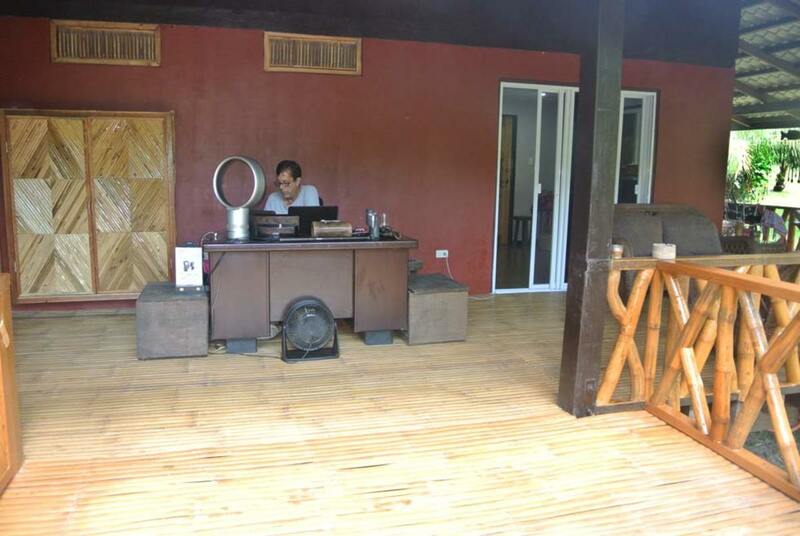 We added a kitchen down in the workshop area, a commode, and kithchen initially so we would be comfortable on day trips. But after building those, we saw the potential to build an apartment above the work area. This is the front porch now. We added some finishing touches like putting backs on the steps to the benched landing on staircase. This was so our shoes wouldn't keep falling down to the ground when we took them off and some decorative bamboo fascia on the benches. The original pump house in in back on the left. So much has grown in less than two years as far as plants go! Dec- 2012 -We do get relatively quite a few electrical brownouts here. This was taken during one of those times. We hardly feel it. 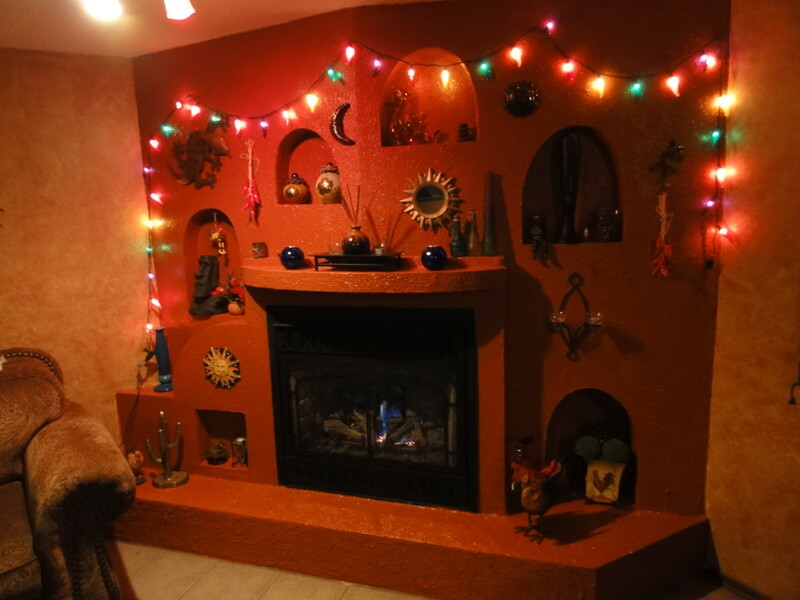 Our place uses LED light bulbs and LED strip/rope lights as well. These will be ready soon..yummy. 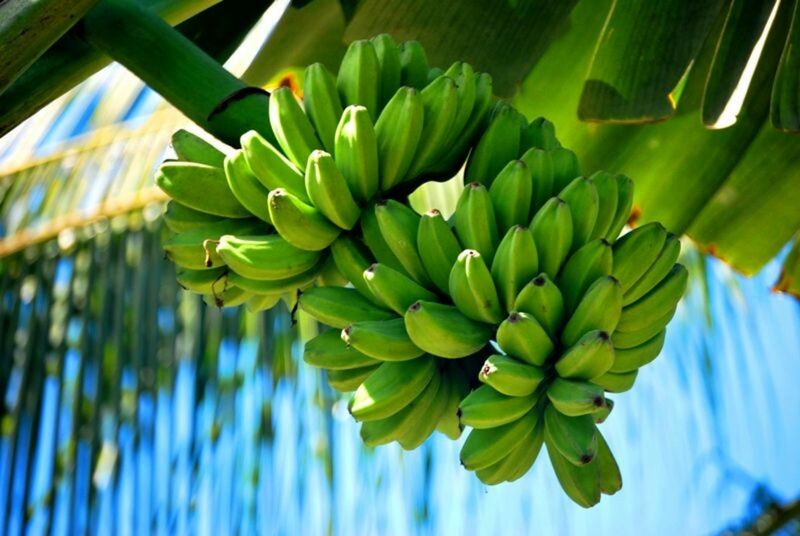 I was pleased to see that we already had a small crop of cooking bananas on the farm. I have watched these grow with great anticipation. They are good caramalized with mascovado natural sugar! Or rolled in lumpia wrappers and fried, then coated with caramalized sugar. All bananas are a good source of natural potassium. Well we did put in a small tilipia fish pond. 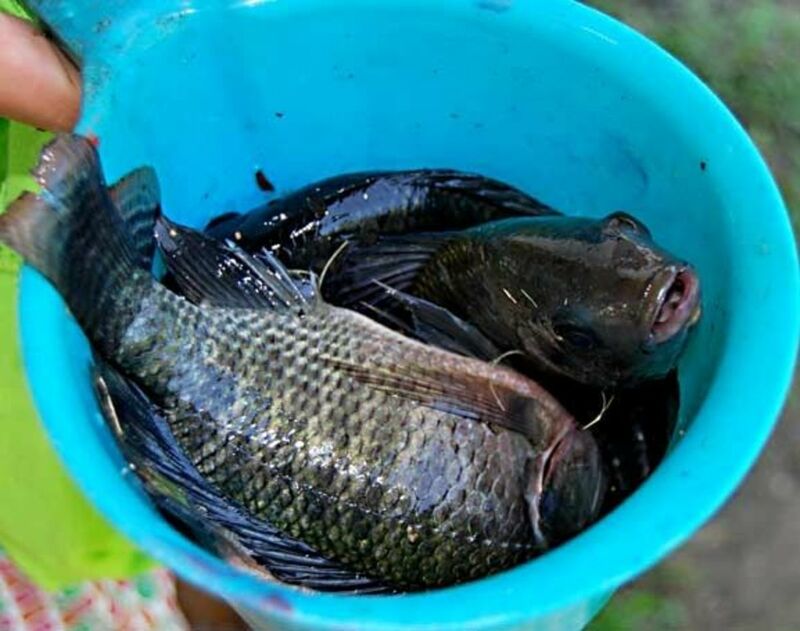 We can now enjoy fresh fish any time. We want to hook this up to an aeroponics system one of these days if we could even get anyone to help us out with it. In the meantime, we get fresh fish when we want it without having to buy from the fishermen or wet market. Okra grown on our farm. 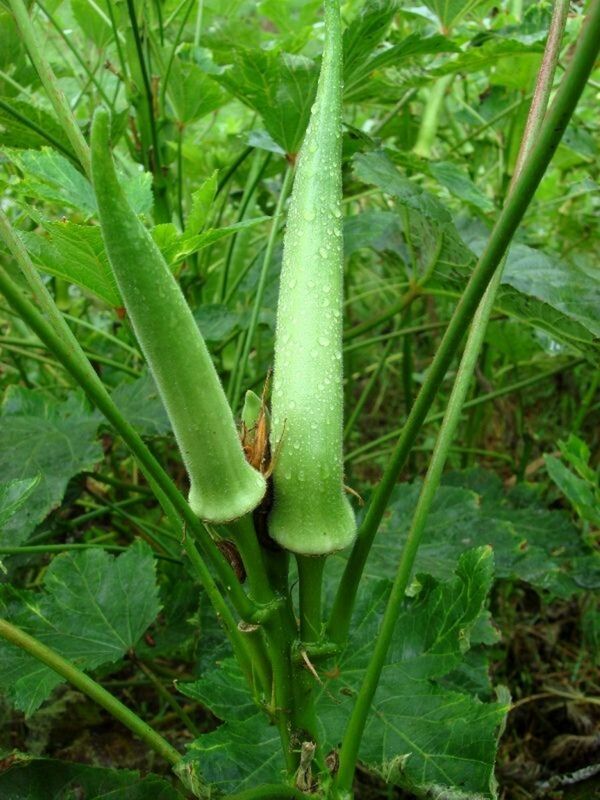 When we bought the farm, the caretakers had a lot of okra planted which they had to leave for us. We have had okra every which way you can, including raw in salads. Good thing I love okra so much. 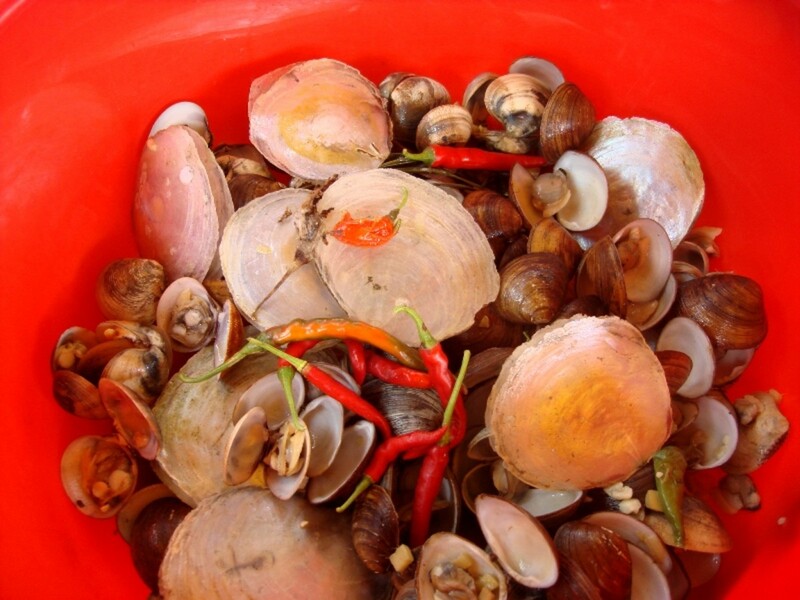 Clams with garlic, onions, giner and chili peppers grown in our garden. There is a clam vendor on the way to the farm. I always buy a few kilos to share with guests and the workers. This day I sautÃ©d onions, garlic, ginger and chili pepper volunteers from the wild garden then tossed in the clams. The master broth at the end of cooking the clams was so tasty with rice! The window in back of couch is the window to the original pump house which has been recently converted to a laundry room and still has the original broken tile floor which is Dave's shower room. To the right is the add on to the original pump house with the bamboo bench table in front of the animal house. My mom gave me this hen and 4 chicks. There was a little chicken coop left over by the previous tenants so it seemed logical to put them in there. Unfortunately, a snake came along and ate the 2 day old chicks in front of this hen. 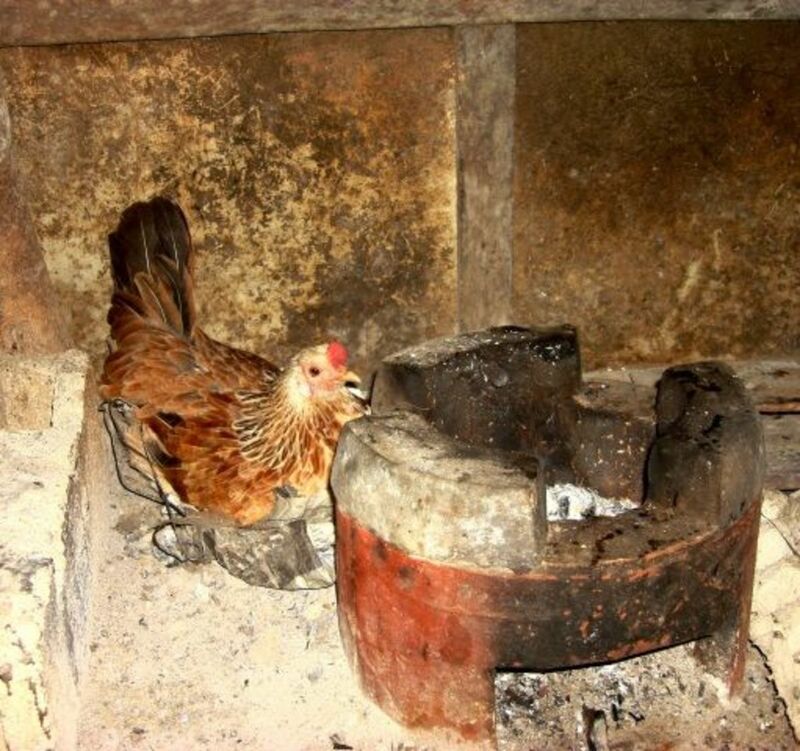 She was so traumatized that when she laid her eggs again, she laid them in back of the caretakers chacoal cooker She has since hatched them and takes them about the farm during the day, but at night she wants back in the native hut! It showed up over a month ago with a broken foot. We could never catch it to fix the foot. Now it won't leave the property and unfotunately the foot has healed in the backward position. Poor thing. It doesn't seem in pain anymore but it knows it's safe on our farm. 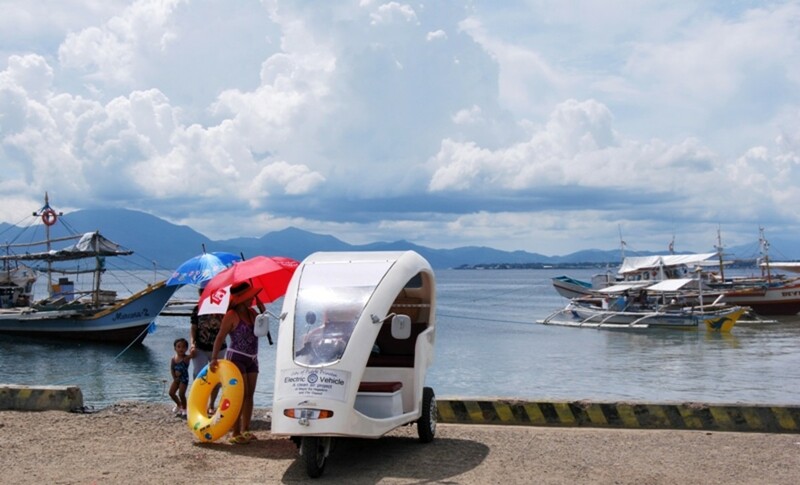 Electric tricycle at the Mangingisda pier. June 2010- We took the eTrike to the farm this day. 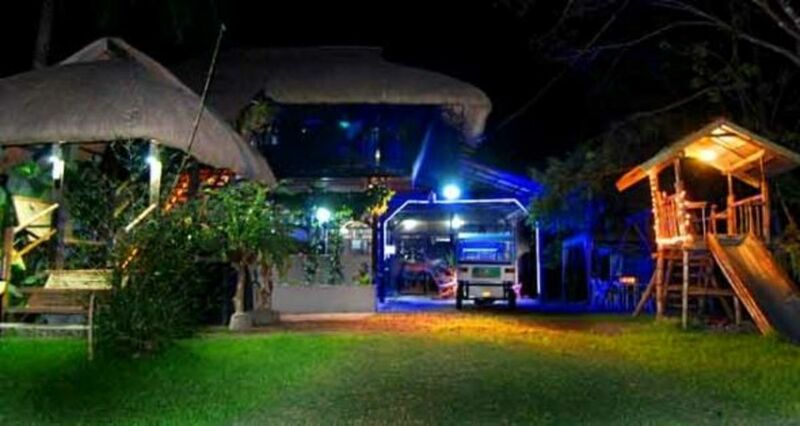 The Mangingisda pier is just a few minutes from the farm in Luzviminda. In June it was so hot we drove drive down to the dock to cool off. Although there are bangka's plying the place, the water was crystal clear emerald green with white sand below. We have been told there is a white beach near by as well but we haven't had a chance to discover it. There are motorized pump boats that take passengers to Puerto Princesa Baywalk pier every hour on the hour from this dock. For convenience, I separated the shower, commode and sink into three parts. This way since it's a shared space, someone could go potty, wash hands and shower without bothering or waiting for any one. You can't see the shower room but it's next door to the commode area. Since we are in the discovery period, please send us links or make helpful comments so we can build a better sustainable community. Please Leave me your comments. I would love to hear from you. @SolarLighting: Thank you so much for taking the time to share your journey! I wish you the best of luck! Ours is an ongoing love affair! This is amazing. I loved reading about your progress and the way you've re-purposed so many items. My spouse and I have been building on our property for 8 years now, as we could locate and acquire usable material. We're hoping to be living above our shop soon, and then on to building a home. Thanks so much for posting your story. Its incredible. @anonymous: Thanks for dropping by and commenting. Enjoy Narra. A bit too far from town for me....I like that we have the ferry to city center from here as an alternative way to get to town. Omg, that is paradise... So many beautiful photos of such a beautiful place... Thanks a lot for sharing this wonderful lens!!! Im so proud and envious of my cousin. Nice farm you have. We should have more people like you and we will have a cleaner and self sustaining environment in this world. This is great. By the way, what did you do for the Water closet area? 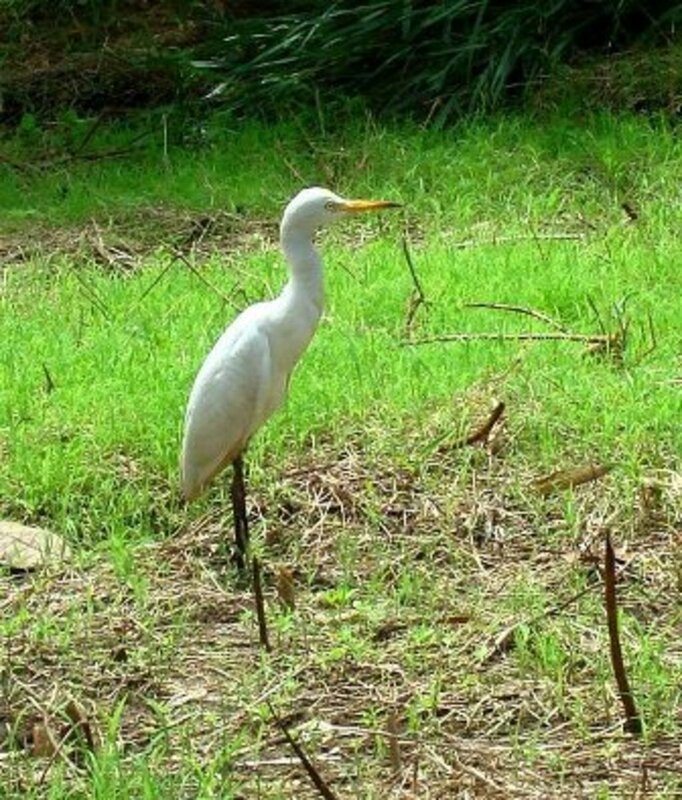 that is so nice that you tried to catch the crane to fix its foot. thank you for sharring this! 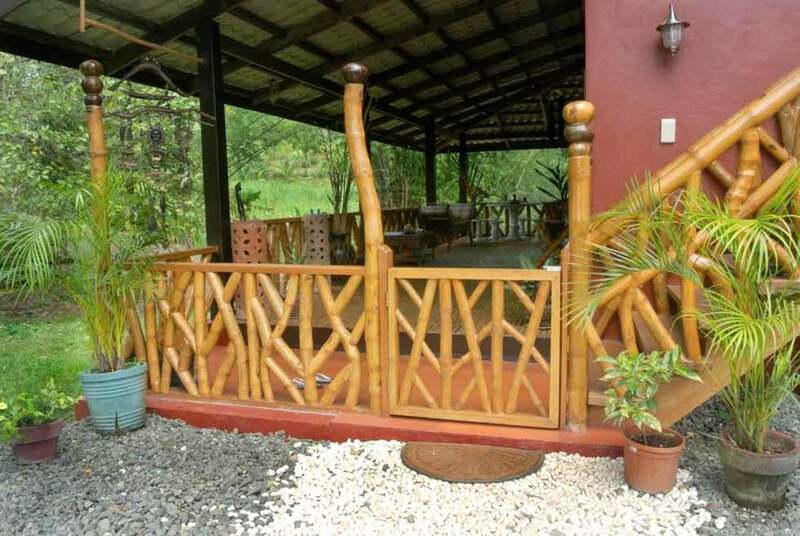 I too build a place in costa rica with sustenability in mind. and you help me greatly with the article and fotos. gracias.. This is such a lovely lens! A great record of developments. The house is so pretty and cosy! I have enjoyed reading your lens! There is so much good information. @anonymous: Sorry unless you leave an email address there is no way for me to reach you. May I use your photo of thorny bamboo for a textbook we are making? can you email me a high res version? @anonymous: Thanks for taking the time to tell me! Beautiful, beautiful, beautiful. Thank you for this beautiful lens. I could live in something you call a shed. That was very nice! @BruceBuss: Hi there, goodness you have so many wonderful lenses yourself. I was thinking the same of your lenses....you mean jealous of the photos? I used to be a pro photographer..hehe Many thanks for dropping by and commenting..! Amazing photos. I am jealous. Cool place. 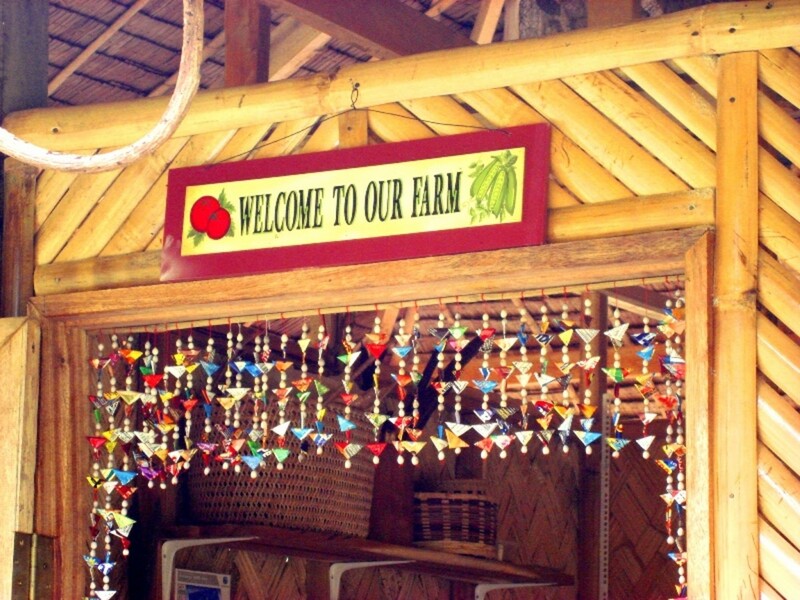 I like what you have done on the farm. Starting ours next! Very interesting that you got the bamboo out of your own groves. How cool is that! That is awesome. Beautiful spot too! Great info! Best of luck. Looking good! I'd love to do what you are doing! More power! Great use of materials. The hut turned out nicely! I love the thatched buildings. Beautiful photos. Love this lens! Love the fact the bamboo is off your own land! @SciTechEditorDave: Editor Dave, wow thanks so much for the great review! And wow you even know some tagalog! Masyado Magandang Lens! You did a beautiful job on this lens--the pictures are absolutely amazing (and inspiring). I've liked, favorited, thumbs-upped, and lensrolled this great lens of yours to my lens on the Philippines! Congratulations on a great job! Lots of work this farm, but what isn't. Building out there certainly is challenging.